Corey Evaldi grew up in Buffalo, NY (Lackawanna). His dad had his own auto repair shop before Corey was even born. In 1988, he built the shop that is still in business today. As a kid, Corey grew up in the house next door to the family garage. The older he turned, the more interested he became in the shop and cars in general. By the age of 12, he began working for his dad. The 1st week he worked there, he would come in whenever he felt like. On Friday his pay was less than half of what was agreed upon and his dad simply said: “you didn’t come in on time”. Never was he late again. He started to enjoy the electronics and troubleshooting of vehicles really young. During his junior and senior year of high school, He went to Potter Road Career and Technical Center and took the Automotive programs. His senior year had an automotive competition at ECC, local community college. He and his partner won 1st place in the competition and were awarded full-tuition scholarships to various schools. They both ended up choosing Ohio Technical College. Job hunting landed him at a gas station attendant position at BP. After 6 months or so, his manager told him he knew someone that had a garage that was looking for some help. That brought Corey to Olmsted Auto Care. From 2006 to 2014, he worked his way up from lube tech, to the service tech, to lead diagnostic tech. At that point, he was looking for his next step. He left Olmsted Auto Care to build a relationship with another shop owner who was looking to sell his business in the next few years. After 6 months or so the partnership at Olmsted Auto Care was no more and the partner left with the business was looking to retire. His feelings for Olmsted Auto Care were still pretty strong so he agreed with the owner to return as shop manager until a Buy-Sell Agreement would be done. In 2015 he returned and was overwhelmed with the responsibilities of running a shop. he was a technician, service writer, accountant, clean up person, the fireman that extinguished fires all over. Beginning of 2016, he and his wife expected their 1st child. He could not keep doing what he was doing. He produced 40% of the billed hours out of 4 techs. He looked for help. Found a coaching firm that really showed him what a business owner looks like. After implementing the changes, there was extreme pushback from the existing crew. After standing firm on most things, change over was inevitable. Most of Corey’s employees he has now had only been with him 3 years. At this point, he still needed more help with the business. Dave Justice from RSOT knew his now business partner and talked with us on joining RSOT. They agreed and was the best decision yet. He learned how to behave like a professional; helping him become a better leader every day. They implemented different marketing strategies, SOPs, learned how to measure and manage KPIs. Now Corey has a great team that is behind him and the decision he brings to the table. They are currently looking to add another bay. Eventually, Corey would like to grow to multiple locations. 1987 could not weather. Bellyup. Started buying and selling hay. After college. Commodity sales. Diesel trucks. Always used an outside shop. Other ways to maintain the fleet. He had an idea to build a business out of this. To prove he started with his dads fleet. Not a tech by trade. Measure and manage his labor. Within 2 weeks he had a grip. He started to tweak the bus and fine-tuned. He had to re-engineer what he had to do for his people. He realized his people were just not a number. Chris had to strengthen his bottom line so he could build his pay and program. His benefits package is worth $14.50 per hour. Chris is using radio besides social media to recruit. He is always recruiting. Corey’s transformation included working with his team to understand his goals and changes. He did have resistance. He realized that the business was running him. A big change was a hybrid change to individual compensation. It is in his blood to be in the bays, but he causes more havoc when he is there. He loves perfection and is addicted to winning. Holds meetings with his people where their input is critical to the running of the business. Corey has taken on an apprentice. Will create a tool allowance based on continuous technician education and ASE Certificates. Chris likes to lead his life with no excuses. Use your energy to help people. He believes his generosity, kindness and his willingness to listen are his strong leadership traits. He has created a family culture with a strong vision. His family culture is work. It makes them feel good. They looked at all aspects of the shop visit. 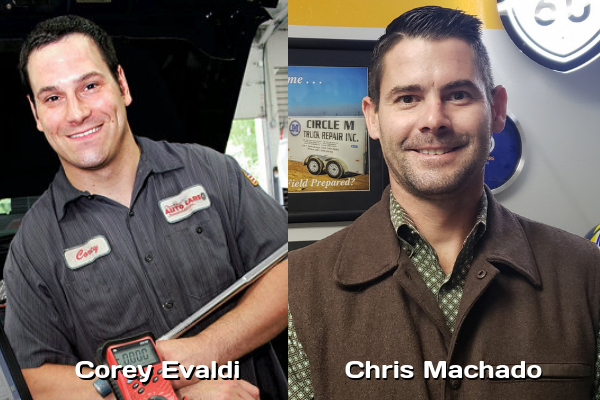 Thanks to Chris Machado and Corey Evaldi for their contribution to the aftermarket’s premier podcast.